I asked the Rt. Hon Alan Johnson MP to be the first person to be interviewed for the page and he generously agreed. Because I have always held firm to the conviction that childhood circumstances do not determine the adult and that if a child has just one person in their life who nurtures and protects them, regardless of the relationship to them, this is more important in helping the child thrive than the familial framework that statutory services often focus solely on. I have interviewed quite a few foreboding characters in my time, including a High Court Judge, numerous Category A Prisoners and Senior Criminal Justice professionals. Having interviewed these scary characters without a beat of nerves I was just looking forward to shooting the breeze with Alan Johnson. Favourite word? “Apricity: the word for “feeling sunshine on your face in winter”. I too was taken by this great, obscure word – he had come across it while reading Reading the OED: One Man, One Year, 21,730 pages by Ammon Shea. Alan cooks to relax: “I don’t do desserts or cakes. I like to cook for relaxation: complicated dishes that take ages – last night for instance I cooked a mushroom lasagne with five different cheeses”. His favourite TV programme is Professor Brian Cox’s Wonders of the Solar System and he is a Fawlty Towers man for comedy. His favourite book? Possession by A S Byatt. If it is possible to get a glimpse of the person by their choice of literature – the plot of Possession is anything but straight forward, full of twists and turns, doubts and triumphs. But there’s the thing of it – I just wondered but didn’t ask. The team were right “never interview someone you admire so much”. Whom did he most admire on the world stage? “Barack Obama”. Alan Johnson did not have the most conventional upbringing, being orphaned very young, he was brought up by his sister, Linda, who was only 3 years older. Linda organised things so that Social Services played a minimal role in their life apart from Mr Pepper, their Welfare Officer who believed in Linda’s ability to care for herself and Alan. Mr Pepper arranged for them to move to a council flat in Battersea. A creative, brave decision like that made by Mr Pepper would not, in all probability be made today. An Initial Assessment would have been conducted, leading to a Core Assessment, resulting in a Care Plan – which may feature a proposal to place both siblings with a foster carer together where possible or for the 11 yr old to be placed in foster care and the 15 yr old possibly into a residential care due to her age. We can just imagine the amount of professionals that would be involved: Psychologists, Counsellors, Social Worker, Education Staff, Health staff and other specialists, and the numerous weekly appointments for both children would have to attend. The 2011 social work approach would also have the additional pressure resulting from high profile media cases and decisions would be taken by social services in order to ‘cover their back’. A Strategy Meeting would have taken place where all might have agreed that a 15 year old was ‘still a minor’ and had her own “bereavement and loss” issues and therefore incapable of rearing a younger sibling. I think it’s also the case today that no Social Worker would have the confidence to bring such a decision to the table. I asked Alan what he thought the strategy would have been then if Mr Pepper had been less intuitive. “I suppose we would have gone into local authority care. I think the plan was that one of us would have been fostered and the other placed in a children’s home. I wondered who, apart from Linda, had influenced him most as a child? There was no hesitation: “Lonnie Donnegan”. I smiled at this, thinking perhaps that he was avoiding any deeper conversation but on reflection of course it would be Lonnie Donegan, the father of Skiffle, who inspired Alan to pick up a guitar – Alan played in the Soho clubs at 16 and only went on to become a postman when his instruments were stolen for a second time, because his friend – equally frustrated at their music ambitions being thwarted by frequent robberies – was going along for an interview and Alan tagged along. I think the “tagging along” is an important point because I can’t imagine the musician Johnson declaring “I am going to plan a career in the post office!” I have always thought that his bio should really read, “Alan Johnson – Musician turned Trade Unionist” rather than the “postman turned politician” tag that always introduces him. I wondered whether he had to resist trying to influence his children in their musical taste or whether he was one of those trendy dads who know the same stuff they do? “My eldest son Jamie, works in the music business so we discuss music of course. I often ring him and nag him about a band I have heard and suggest he listens to them. The Len Price Three for instance, was a recent band I heard that I thought he should be aware of”. http://www.youtube.com/watch?v=yUghPiEfd5Y&feature=related and realised that once a musician – always a musician: no easy, middle-aged ballads for Alan Johnson, obviously. I expressed surprise at this, given that he had held some of the highest positions in government but he was adamant that he was the exception to the rule and that he would not have wanted his children to leave school early. Alan was quite emphatic that he would hate to be a role model for kids leaving school early. Not many politicians have had the experience of a real job, in the real world, before they came into politics and certainly not often afterwards – had he ever been aware that he had an insight into the lives or ordinary people that his colleagues didn’t? “I think that’s a little unfair on many of my colleagues who have shared a similar background. Thirty or forty years ago – it would have been the norm I suppose for politicians to have had a real job before entering politics. There is of course a treadmill now of young people entering as Special Advisers, getting a Seat and becoming members of parliament much earlier but this can equally allow for seriously talented people such as the current leader of the labour party who entered parliament as a Special Adviser”. I grew up in the same circumstances as Alan Johnson, and he has said before that although the 1950s is often referred to as a golden age, it was not a rosy time for everyone and that poverty existed in a real way. What, I wondered, did he think was better for working class people today? “The minimum wage; decent housing; better education; equality; better environment; protection for women from domestic violence. It’s a different world of course, young people didn’t have the internet then for instance. What personal ambitions, rather than political, did he still have that have not yet been realised? As soon as I asked the question, I knew what his answer would be: “A rock star!” of course. Alan Johnson is planning to write a book about his early life – not his life in politics but his life before that. There’s the thing of it, I realised – the reason he is so popular among the party faithful and indeed many outside of politics who I have spoken to who nominated him “the man they would most like to have a pint with”: there didn’t seem one shred of pomposity or snobbery about him which can often accompany “the boy made good” caricature that people hang on him. I was aware of that lack of “puffed chest” when I asked him whether he ever stood at his window with the view across Whitehall and the House of Commons and declared “look at what I achieved…” and he looked at me as if he didn’t even understand the question. I have often thought that it is the dream that we didn’t follow, rather than the accomplishment we did, that continues to drive us and I think maybe Alan Johnson’s “puffed chest” is firmly in the Soho clubs, with his guitar strung low (I’m guessing here but he doesn’t seem like man who would wear it high, folk singer style). 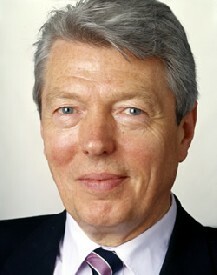 Alan Johnson was born in May 1950. Educated at Sloane Grammar School, Chelsea, he became a postman in London in 1968 and at the same time joined the Union of Communication Workers. In 1969 he transferred to Slough in Berkshire, elected to the Branch Committee in 1973 and became Chairman of the Slough Branch in 1976. Alan was elected to the National Executive Council of the Union of Communication Workers in 1981. In 1987, he became a full-time Officer of the UCW, mainly responsible for national negotiations on behalf of 100,000 postal, delivery and sorting staff – becoming the youngest General Secretary in the history of the UCW when he was elected to the post in January 1992. He was also a Director of Unity Trust Bank plc and a member of Ruskin College Oxford Governing Council. He has also spoken in the Commons on the Post Office matters, the Jenkins Report (he is a leading advocate of electoral reform), working time, fairness at work, fisherman’s pensions and the loss of the trawler “Gaul”. Alan served on the Trade and Industry Select Committee until he was made Parliamentary Private Secretary to the Financial Secretary to the treasury in December 1997. A year later he became PPS to the Paymaster General and promoted to the position of minister for competitiveness at the Department for Trade and Industry in the summer of 1999. In the reshuffle of June 2003, Alan was given a new post with another department as Minister of State for Lifelong Learning, Higher and Further Education at the Department for Education and Skills (DfES). It was in this role that he helped to steer legislation introducing tuition fees onto the statute books arguing that in 40 years of free higher education the social class gap had widened rather than narrowed and that Graduates should make a contribution to their degree course (£1 in every £14 spent) to help fund the expansion of Higher Education and the return of maintenance grants for the poorest students. The Prime Minister announced a major reshuffle to his cabinet on Friday 5th May 2006 which led to his appointment as Secretary of State for Education and Skills. On June 27th 2007 Gordon Brown became the 74th British Prime Minister and made Alan Secretary of State for Health. Two years later, Alan was appointed Home Secretary and shadowed this position for five months following Labour’s defeat in the 2010 General Election.